The odds of filling out a perfect March Madness bracket are one in 9,223,372,036,854,775,808 (that’s quintillion). Despite the daunting odds, every year millions of people cross their fingers and fill out a bracket. Some people base their brackets on stats, hoping the current numbers will carry them through to the finish line. Others, who arguably know better, base their brackets more on faith; picking their Alma mater who barely made the cut or the team with their favorite colors to win the whole thing. But March Madness, much like life, is full of surprises and upsets and none of Warren Buffet’s fortune. And though the odds say that your bracket will be bunk, your trophy can still be a slam dunk. At Far Out Awards, we pride ourselves in making the most unique and high quality trophies for any occasion and March Madness is no exception to that rule. Our Prestige and Golden Basketball Prestige Fantasy Trophy are over 2 feet tall and 10″ wide! Our Finger Roll Basketball Trophy and Jump Shot Basketball Trophy are closer to 3 feet tall and feature realistic resin sculptures that really bring your award to life. Of course we have our signature beer awards, like the Far Out Fantasy Basketball Beer Trophy and the MVP Beer Basketball Trophy to name a few. Clearly we think that our signature basketball trophy selection is impressive on its own, but the true slam dunk for us at Far Out Awards is when we bring your custom awards to life. 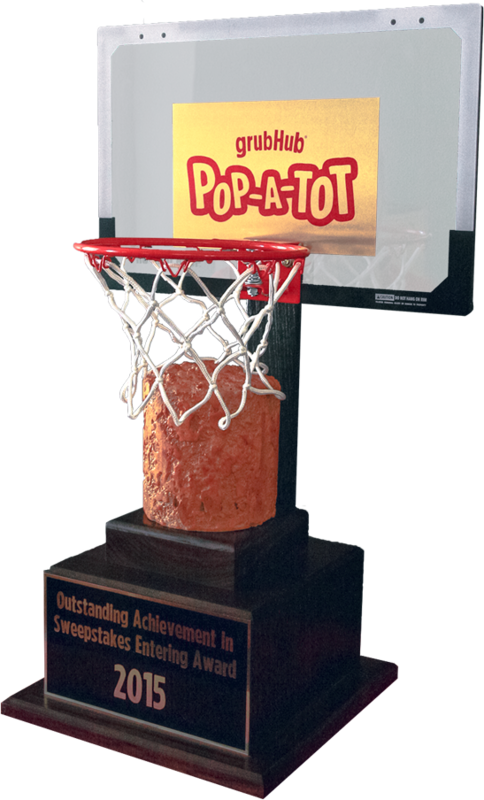 If you are asking yourself, “is that a trophy of a giant tater tot being shot through a basketball hoop?” The answer is yes. Because, why not! 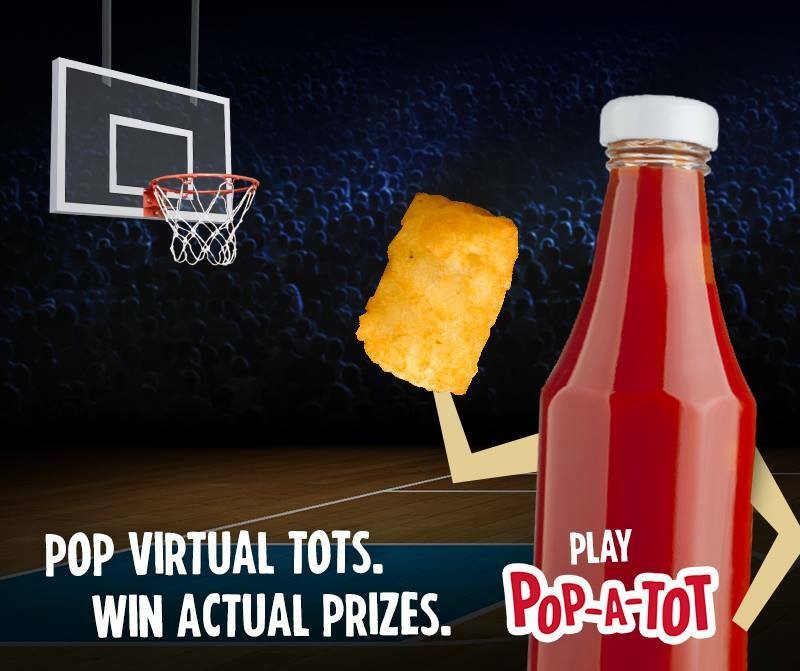 To celebrate the Madness, GrubHub created Pop-A-Tot: a virtual game that allows players (or a bottle of ketchup) to shoot tater tots through a basketball hoop for a chance to win real prizes- including a GrubHub Jersey or the Far Out Pop-A-Tot Award. In addition to physical prizes, GrubHub’s Pop-A-Tot program gave gamers a chance to win GrubHub discounts worth 5-30% off their next order, depending on their tot poppin’ skills. GrubHub’s timed tot-ball game was brilliantly simple, but wildly addicting. The more tots you sank into the hoop, the higher discount you received. The most I ever got off was 15% off, which ain’t a bad deal at all considering I’m neither a baller nor a gamer. Unfortunately, just as the tournament, Pop-A-Tot has retired for the year. But will Pop-A-Tot be back? Only time will tell. All I know is, you have a better chance of scoring with GrubHub than you do betting on a bracket, so tot willing (buh dum tss), next year I’ll spend more of my free time sinking spuds.